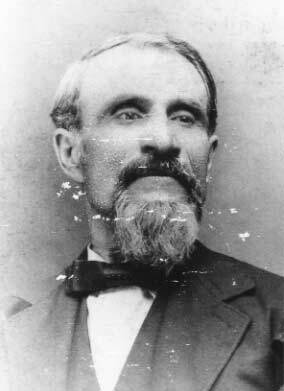 Joseph Caise was born in Rochester, New York on February 14, 1842. His parents were David and Elisabeth Leclerc Caise. Military records, unaware of the French extraction of the Caise surname generally refer to Joseph as "Joseph Case", but occasionally as "Caisse" or "Caise". On February 12, 1862, at Middleport, Caise enlisted in Company C of the Fifty-First Illinois infantry. The regiment was about to leave Camp Douglas and training for "the war" and was trying to build out its numbers with continuing recruiting efforts. Joseph caught up with the regiment at Cairo in southern Illinois and was formally mustered in on February 16. He missed the several wintry months of training at Camp Douglas in Chicago but was with the regiment from its earliest campaign at New Madrid, Missouri and Island No. 10. He then boarded river steamers with his regiment and the erst of John Pope's Army of the Mississippi and headed for Fort Pillow in Tennessee. Pope's force barely arrived there before the Army of the Mississippi was turned around and headed back up the Mississippi, into the Ohio River and then the Tennessee River and to Pittsburg Landing, Tennessee where the Battle of Shiloh was fought two weeks earlier. Throughout this river campaigning and the campaign against Corinth, Mississippi which followed in April and May 1862, Caise's health held good while twenty-five of his regimental mates died of fevers and dysenteries and many others were discharged and sent home because of these diseases. At this point [after advancing across the Lafayette Road into the east Viniard field] we received a murderous and enfilading fire from a fresh brigade of the enemy, thrown out for the evident purpose of turning our flank, and for a moment were compelled to fall back below the crest of the rising ground, taking shelter in a small water-course. Here rallying the men, we again charged forward, and gained the fence lining the west side of the woods which skirted the crest of the ridge and maintained our ground in the front, while a battery in our rear drove the enemy advancing from the woods on our left. I was compelled to crowd my left toward the right, as the fire from the battery passed through it, killing and wounding several. I also directed what remained of the left wing to fire “left-oblique.” and in a few moments the enemy were flying from our front in great disorder. Despite Raymond's report that several were killed and wounded by this artillery fire, Joseph Caise is the only one listed among the regiment's 149 casualties who suffered a wound from artillery fire. In any case, Caise was moved to the division hospital at Crawfish Springs south of the line of battle. When the exposed Crawfish Springs hospital was threatened by Confederate cavalry on September 20, the wounded who could be moved were hastily loaded onto horses and mules and into ambulances and moved off toward Chattanooga. But here Joseph—along with many other wounded of the regiment, one of the regimental physicians left behind to tend the wounded, and several hospital attendants—was captured by enemy troopers. For about ten days Joseph was a prisoner of war. Then the ironic good luck of being-wounded came to his assistance. The Federal wounded who could not walk—who could not march off through Georgia to the railroad at Dalton and eventual imprisonment at Richmond, Danville, and Andersonville—were released on parole and ambulances carried them back to Federal military hospitals in Chattanooga. For the next five or six months Joseph was a paroled prisoner of war, awaiting official exchange—and also waiting for the severe contusion to heal. The shell wound to Caise's hip did not break any bones and, by the time of the Georgia campaign of Spring 1864, Joseph had healed, been formally exchanged as a prisoner, and was able to rejoin the Fifty-First. He was with the regiment in its May engagements at Rocky Face Ridge, Resaca, and Dallas; its ill-conceived, ill-fated Kennesaw Mountain charge on June 27; and Peach Tree Creek on July 20. On July 22, 1864, as the Fifty-First played its role in tightening the siege against Atlanta, Joseph was again wounded. As the regiment moved to a new position, a shell fragment struck Joseph and penetrated his right thigh. Captain Albert Tilton was in command of the regiment that day and was moving alongside the regimental line near Caise as the Fifty-First shifted position. Allen Eastburn was marching along behind Caise. When Caise was hit and fell, Tilton and Eastburn caught him. Tilton told Eastburn to help Joseph to the rear to find medical care. This wound did Caise much more damage than his Chickamauga wound—"struck by a fragment of shell, upon the anterior surface middle third right thigh, the fragment penetrating deeply," one of his doctors said. The shell fragment remained embedded in the muscle of the leg; it was removed sometime later, by surgery. Caise spent the next six months in military hospitals in Chattanooga, Nashville, and Jeffersonville, Indiana. He was finally restored to at least partial health and mobility. His doctors discharged him from the service, but Caise refused the discharge and returned to the regiment at its camp in Alabama in January, 1865—when all Fifty-First's fighting but not all its service obligations were ended. After the war Joseph returned to Illinois—farming and raising a family in Illinois in Papineau (Iroquois County) from 1865 to 1895. On September 24, 1866 he married Eulalie Boudreau (daughter of Godfroid and Mathilde Charest Boudreau) at St. Mary's Church in Beaverville, Illinois. They had seven children: Henry, Joseph Jr., David, Phillip, Anna, Nelda, and Josephine. In 1895 Caise changed his residence to St. Anne (Kankakee County); Papineau and St. Anne were two French-settled towns about five miles apart. 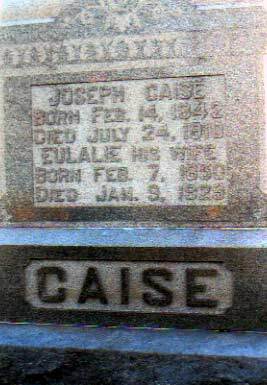 Joseph died July 24, 1910 at his home in St. Anne, Illinois. The immediate cause of his death, according to pension records, was pneumonia. He was buried in St. Anne Catholic Cemetery. Eulalie lived on until 1929. Joseph Case, Compiled Service Record, Records of the Adjutant General's Office, 1780's-1917, Record Group 94, National Archives and Records Administration, Washington, D.C.
Joseph Caise, Pension File, Records of the Veterans Administration, Record Group 15, National Archives and Records Administration, Washington, D.C. Many thanks to Percy Caise Jr., Joseph Caise's great grandson, for photos and family information.